Aero 360 is a flat ride. It is fast, fun rerideable, it has a large capacity, and a long duration. Though not as good as Dorneys, this was a great flat ride. This one was very comfortable and there was plenty of hang-time going over the top, especially when they hung us there for a long time. There were some really strong Gs coming down from swings and this had a good cycle as well. Starting from the use of the Kennywood arrows for decoration, including the punny name (Aero vs Arrow), the views of the park and the river, and of course the ride itself, this is a fun ride. 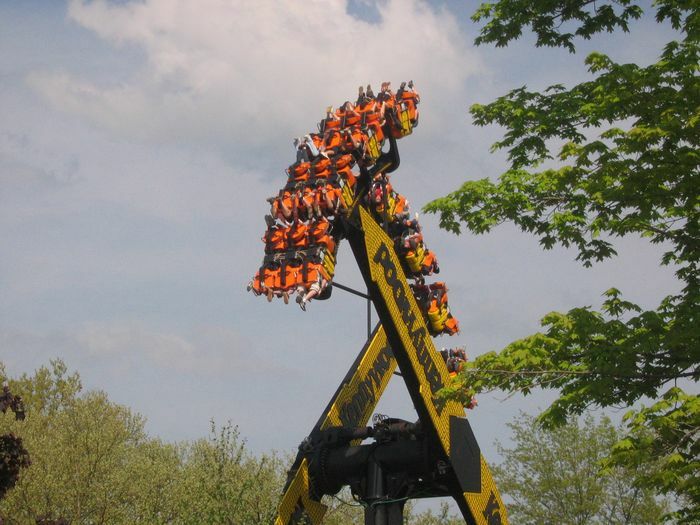 Having 2 arms is a great idea both to increase capacity and to be able to see the reactions of the people on the other arm, at certain parts of the ride, especially if riding on the outside facing seats at the ends. For me, I find these pendulum type rides so relaxing, if the cycle is long enough, I almost doze off. On this ride the cycle wasnt quite long enough, but it is still a very good flat. APPEARANCE-9 The use of the arrows makes it absolutely cool to look at. CAPACITY-6 Seemed to take way to long to load up. RIDE QUALITY-7 Not my favorite type of ride but this one was very smooth and pretty comfortable. Great views of the park. FUN-8 I had a good time with lots of laughs and a little fear of death. RERIDE-6 All depends on my mood. OVERALL-36 AVG-7.2 I will go 7 but I am really glad I tried it. I love the use of the Kennywood arrows on the arms of the ride. The ride definitely makes your stomach turn and it is fun being upside down trying to take in the rest of the park. The ride is smooth and the restraints are comfortable but dont ride with change in your pocket. Wow. GREAT ride. The very first time I rode this, I was on the very end, and didnt hold on once during the entire ride!! And yes, it feels like you will fall out of your seat - but I figure that I wouldnt be able to hold on anyway, so holding onto the restraint doesnt help anything except to give you a false sense of security. Awesome ride, dont miss it if you like to go upside-down. And dont hold on!! i like this ride but not as much as i used too. ever since i road the swing shot, this ride hasnt been as great. ITs too slow for me, and its not thrilling anymore. it may seem kinda weird for me to say this but i feel "TOO" safe when i ride it. the swing shot has that feeling of almost falling out, thats what makes it fun. The aeros OTSR are too tight when i put them down and i cant move at all. I like freedom on some rides. All in all its still a pretty good ride. just doesnt do anything for me anymore. I really enjoyed this ride. Make sure your pockets are empty or zipped up! This is probably my all time favorite flat ride. I am more of a roller coaster person but this ride is totally worth it. The best thing about it is the fact that it doesnt spin and make you dizzy. All the movement is vertical. The design is also very creative and the seats are awesome!